Creamy brown rice risotto is possible, but you have to know the secret… Parboiling. 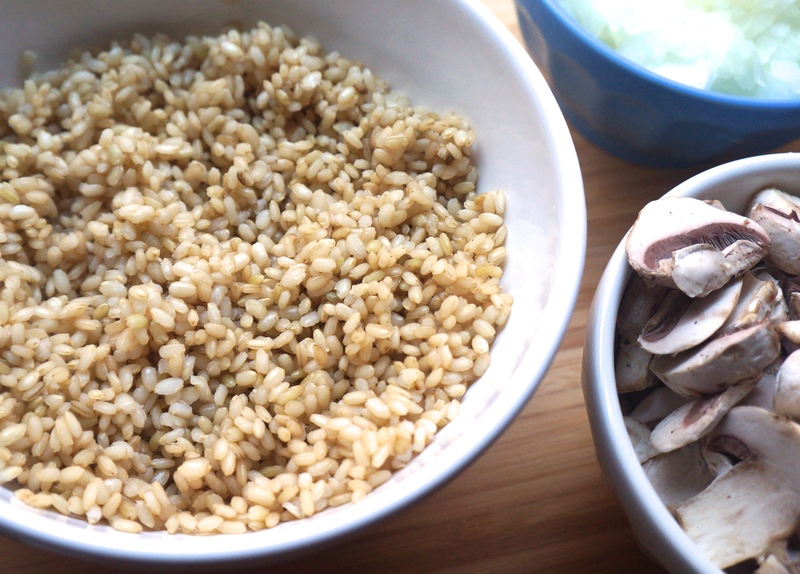 Basically, the trick is to boil the brown rice for 15 minutes before you begin the recipe. This gives the rice a nice head start. After all, it has a long way to go to get from nutty and chewy to tender and creamy. 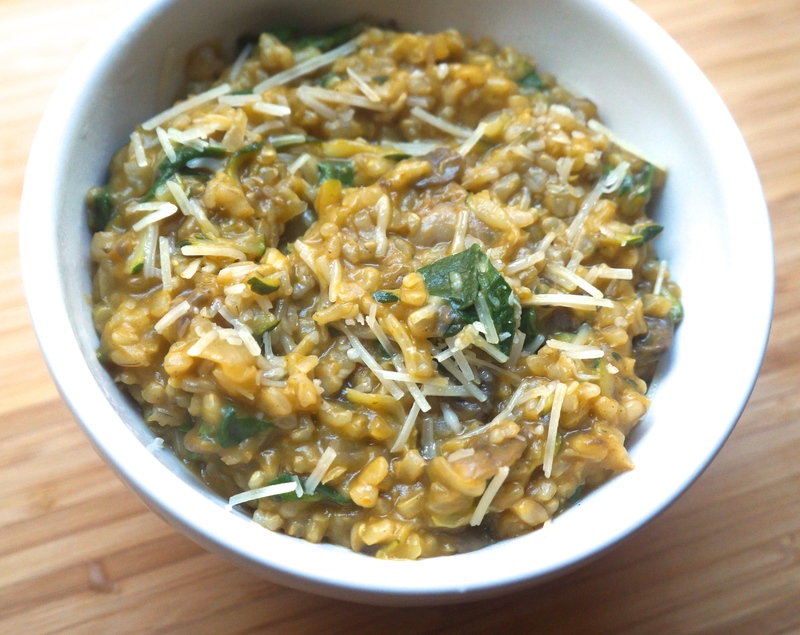 Don’t be fooled, risotto is still a sweat-inducing labor of love! But if you have ever wanted a healthy whole grain version (and I hope you have! ), it is actually quite easier than you think. Staying true to the season, pumpkin is the star here. 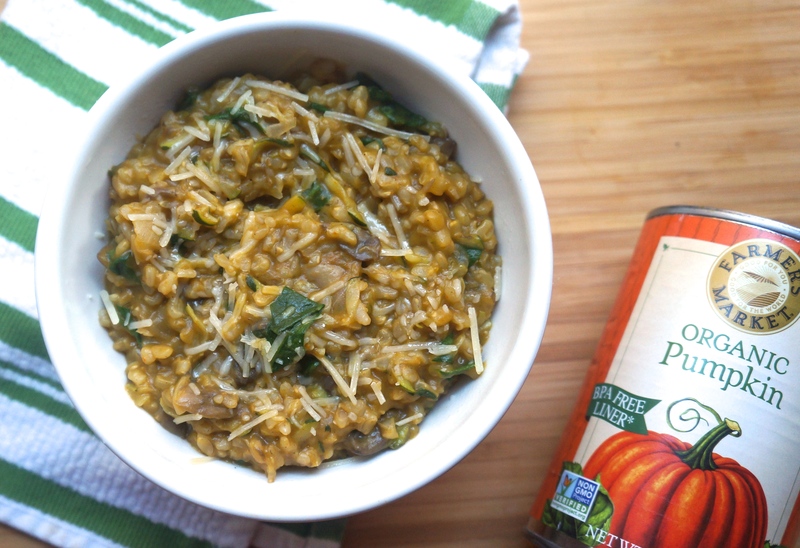 Not only does it give this recipe a punch of autumn goodness, it also lends a velvety, milky texture to the risotto. I used a can, but feel free to use a fresh pumpkin and puree it yourself! As for the veggies, the mushrooms and spinach were a no-brainer, but the zucchini was a fun little addition that I threw in after coming across this recipe. After all, when it comes to vegetables, the more the merrier. This recipe is hearty, healthy, and completely filling! For a little protein boost, I recommend topping with a poached egg (6g protein), or serving alongside a simply prepared fillet of fish, such as sole (11g protein for a 3 oz fillet), or a rotisserie chicken (23g protein for 3 oz of chicken breast). In a small pot, bring the rice and 3-4 cups of water to a boil. Let boil for 15 minutes, then drain off any excess water and set aside. In a small pot, heat the broth until it is hot, but not boiling, then reduce to a simmer. In a medium or large pot, heat the olive oil over medium heat. Add the onions and mushrooms, and cook until the onions become translucent, about 5 minutes. Add the parboiled rice and stir for about 1 minute to coat with oil. Add the wine, and stir continuously until the liquid has absorbed and the wine has evaporated, about 3 minutes. Once the broth has been absorbed, add the pumpkin, zucchini, cinnamon, and nutmeg. Stir to combine, then continue stirring until the mixture has thickened up a bit and reached a desired texture, about 5-10 minutes depending on preference. Add the chopped spinach, and stir until spinach has wilted, 1-2 minutes. 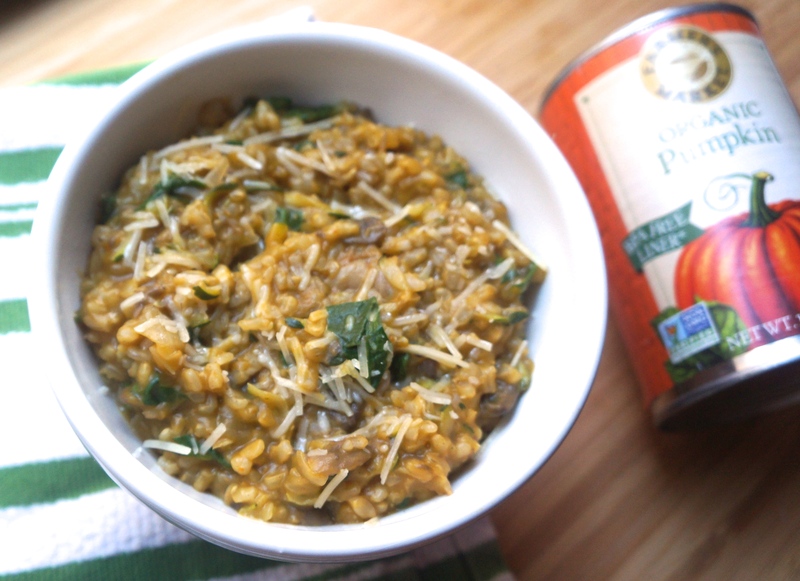 Remove risotto from heat, divide into 4 bowls, then top each bowl with 1 tablespoon Parmesan cheese. WOW! I always thought of cooking risotto as intimidating, but you make it seem so easy. You’re right, the pumpkin is the star. Perfect fall dish! Can’t wait to conquer this one.